I don’t know exactly what spurred the urge, but sometime early December I got a serious case of waffles-on-the-brain. And it suddenly became clear that waffles aren’t on nearly as many menus as you might hope when suffering such an affliction. Not that I go out for breakfast all that often these days. That meal’s usually just a cup of coffee and bowl of cereal at home. But the few times that I did go out hoping for a nice warm, crisp, flavorful waffle I found only its brethren: French toast and pancakes. And they definitely don’t have those little crevaces of deliciousness to hold creamy butter and syrup! Over a month later, waffle craving still unsatisfied, I had to take matters in my own hands. 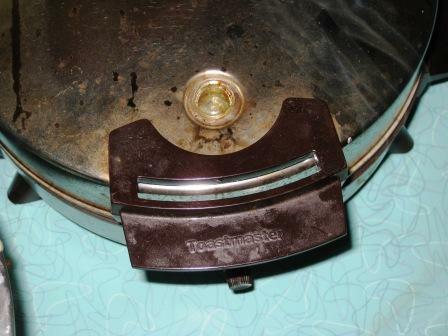 I pulled that simple old waffle iron from the lower cabinet and dug up a recipe. I don’t make waffles often, for that aforementioned habit of keeping breakfast simple. But I had gone through a waffle-making phase this summer while developing recipes for my new cookbook, Gourmet Game Night (coming out early March!). The premise of the book is foods that are perfect partners for playing games, things that won’t get fingers messy and greasy, items that don’t require you to put down your cards to pick up a knife and fork. In the realm of sandwiches, I was dreaming of some interesting twist on peanut butter and jelly that would use waffles for the bread. Long story short, after multiple attempts at the recipe, I just had to walk away. Waffles weren’t working out. The recipe now sandwiches the berry jam-mascarpone filling between peanut buttery brownies instead. That leaves me with this peanut butter waffle recipe that I’d developed. Maybe it didn’t work in that sandwich motif to accompany playing games. But as a stand-alone waffle I was pretty happy. So out of my recipes-that-didn’t-work recycle bin and back into the kitchen to help appease this waffle craving. I’ve come to love graham flour in this past year or so, the nutty flavor it adds to recipes a welcome addition. I thought it would be a great partner to the peanut butter component of this batter. Because peanut butter is so delightfully high in fat (GOOD fat! ), I did away with the melted butter that is typically in a waffle recipe. Should you want to omit the peanut butter, this recipe should work just fine using 1/2 cup melted unsalted butter instead. Man, these waffles did hit the spot. And there’s really no sense in making just enough waffles for one. I went ahead and cooked off all the batter and once the extra waffles were cool, packed them into a resealable plastic bag and popped them into the freezer. Now it’s a matter of a few minutes in the toaster and it’s waffles for breakfast again! In fact, I think I hear them calling my name right now…..
Stir together the all-purpose and graham flours, sugar, baking soda, and salt in a large bowl. In a medium bowl, gently whisk together the buttermilk and peanut butter until smooth and well combined. Add the egg yolks and blend until smooth. Add the wet ingredients to the dry ingredient and stir gently just to mix. Whip the egg whites with an electric mixer until soft peaks form. Add about one third of the egg whites to the batter and use a rubber spatula to briskly fold them in to lighten the batter, then more gently fold in the remaining egg whites. 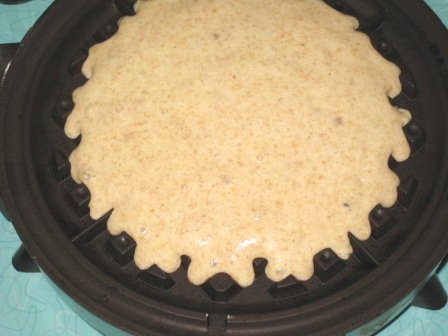 Pour a generous 1/2 cup of the batter onto the waffle iron (more or less depending on the size of your iron). 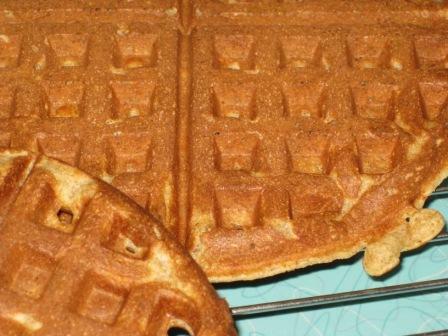 Close the waffle iron and cook until lightly browned, 5 to 7 minutes. Continue with the remaining batter. Serve warm, with butter and maple syrup or a schmear of your favorite jam. This morning’s breakfast was a particularly good eye-opener, a nice change of pace from my standard fare (english muffin with peanut butter, yogurt with Grape Nuts, bowl of cereal). 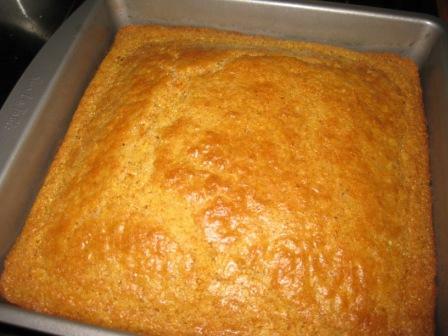 Today, I slipped a piece of cornbread from the pan in which I’d baked it yesterday. I cut the piece in half and toasted it for a few minutes under the broiler. The tiniest swipe of butter, a nice spread of some homemade Meyer lemon marmalade that a friend made. Peppered with occasional sips of reviving coffee, it was a delightful breakfast. One I’ll repeat as long as that pan of cornbread holds out. I’d been looking at that bag of cornmeal on my kitchen cupboard for a couple of months now, the one I brought home from my October trip to Philadelphia. Visiting friends in nearby Chester County before hitting the city had included a quick trip to The Mill at Anselma, a historic site that has been grinding grains for over 250 years. I bought a bag of their cornmeal in the “dark roasted” style, intrigued by a product I’d never used before. The Pennsylvania-grown corn is milled, the grains toasted before packing. Even while I was stirring the batter, the distinctive nutty aroma of the cornmeal was easy to notice. 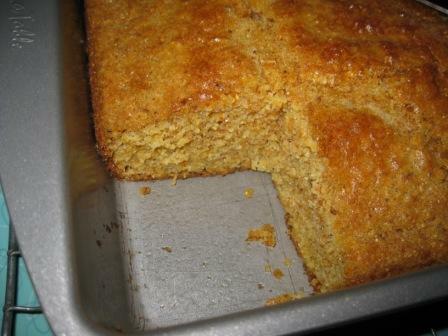 Even more so when the pan of golden bread came from the oven, smelling as much like a hazelnut cake as a cornbread. I haven’t done much snooping for it around the Seattle area, so have no idea if dark roasted cornmeal is available from other sources. 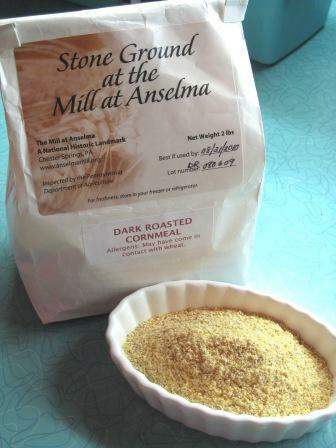 But the gift shop where I bought the cornmeal at the mill will mail products as well, ordered over the phone. I had to make a few amendments. I’m not much of a baker, to the degree that it takes forever for me to go through a tin of baking powder. Until yesterday. Scattered across the bottom of the tin was only about half of what the recipe called for. I supplemented with baking soda, but know that it really needs a bit of acid to rev up (thus the buttermilk often called for in recipes with baking soda). No buttermilk in the fridge, so I added a couple doses of red wine vinegar to the milk. Not, perhaps, an ideal work-around, but it really did the job yesterday. I guess this recipe ended up being not only a study in how that dark roasted cornmeal tastes, but also one in ingredient replacement! 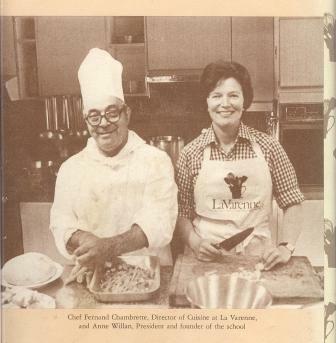 You’ll see other notes about my alterations in the recipe below. Sift all the dry ingredients together in a mixing bowl. Add the eggs and milk and beat with a wooden spoon. Beat in the cream, and lastly the melted butter. Pour into an 8 1/2 x 11-inch well-buttered pan [I used a 9-inch square pan, worked fine] and bake at 400 degrees approximately 15 to 18 minutes. Cut in square while still hot and fold into a napkin before serving. A few months ago a walking buddy mentioned that she’d just checked out my blog for the first time and enjoyed poking around it a bit. “You sure make cooking sound fun,” she said. Thoroughly unconvinced. After a few minutes of chatting with her about cooking at home, it became clear she’s simply one of the non-cooks who roam the planet amongst us who live to cook. With holidays having just passed, it became clear to me again how purely happy it makes me to putter around the kitchen. 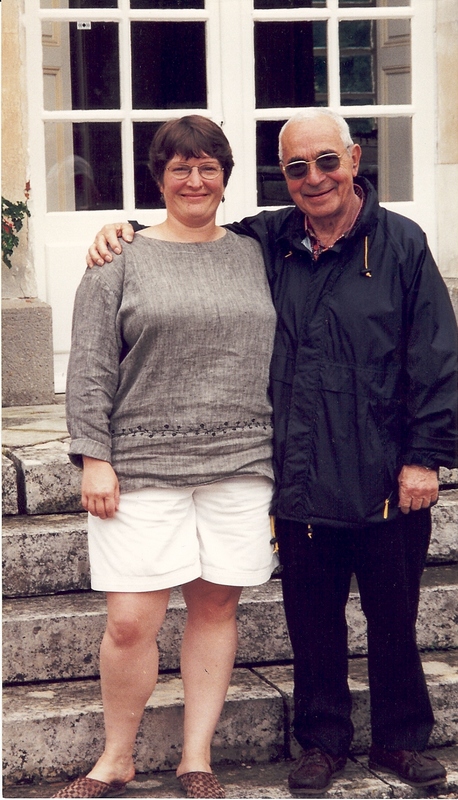 I approached most of our Thanksgiving, Christmas and New Year’s meals with a general plan of action, a menu of sorts. But in all cases I ended up tweaking things as I went, amending plans, adding a new dish or two. I never tire of that creative process, the satisfaction of producing tasty food, the pleasure of the hands-on craft of cooking. So I may have a hard time relating to folks who really just can’t stand to be in the kitchen. But I try not to forget that the non-cooks are out there. I’ve taken my friend’s admission as a motivation, of sorts, to share more often the quickie dinners I make many nights here at home. Just because I’m a cookbook author, recipe developer, food writer — doesn’t mean it’s all stuffed veal roasts and cassoulet every day. I’m a working stiff like the rest of you. And while I do benefit from working at home–which means I can toss a few ingredients together mid-afternoon and set it on the stove to simmer while I keep working–it doesn’t mean I devote a whole lot more to weeknight cooking than do most others. The first few paragraphs of this post describe a very quick braising option for lamb shoulder steaks that is a new personal favorite. It can be varied by using different herbs and spices, maybe orange instead of the lemon. A nice staple to fall back on frequently. And this post with its description of a yogurt-marinated chicken I do quite often has become one of the most-viewed posts in the lifetime of this blog! Clearly everyone’s on the lookout for easy, quick-to-assemble, delicious food that’s still made from scratch. I’ve got nothing at all against canned and frozen foods. As ingredients. I go through plenty of canned tomatoes (extra-delicious San Marzano, for a splurge). We love chickpeas so I always have a can or two of them on hand (good for everything from hummus to stews). Chicken broth (old-school canned Swanson’s or more flavorful organic Pacific, depending) is a standard. I might toss frozen green beans into a stir-fry. A rare “just add water” meal might be falafel, in a pinch. But we don’t have anything on hand that includes instructions like “peel back the plastic and ….” I don’t even own a microwave!! pans. Staples like oil, butter, garlic, onions, maybe a lemon and a bunch of parsley? A few good spices on the shelf (salt and pepper of course; I also love cumin, dried thyme, coriander, red chile flakes, herbes de provence). Just a few fresh things to pick up at the store. You’ll get in the swing. And the flavor’s outstanding. More vibrant. More distinct. Here’s what’s on the stove tonight. 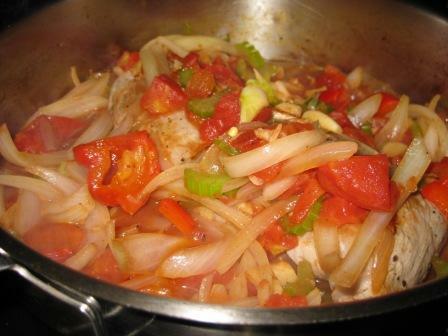 A simplified version of the Basque pipérade, a condiment/side dish that usually involves onions, fresh bell peppers and tomatoes. (A) I’m not a huge fan of fresh bell peppers and (b) I didn’t have any on hand. Plus, (c) a few days ago I’d received in the mail a jar of pickled Calabrian peppers from chef Dustin Clark at Wildwood restaurant down in Portland. He uses them on slow-cooked pork belly with fresh shell beans, and tossed with ricotta cheese gnocchi. Those weren’t on the menu tonight at my house, but I knew the peppers would add some zip to an otherwise standard cut of meat. I had a pork tenderloin on tap for tonight, a longtime favorite quick-dinner choice for me. Many nights I just slather it with Dijon mustard and pressed garlic (or rub it with equal parts ground cumin and coriander) and pop it in the oven to roast. Which would make this a 2-minute prep dinner instead of the maybe 15 minutes it’ll take you to work on this before it goes in the oven. First I took stock of what’s on hand. Onions (it’s a dark day when I look down and don’t see onions in their basket). Garlic (ditto). Celery (nice fresh flavor and crunch). Those aforementioned peppers. Reliable can of diced tomatoes on the kitchen shelf. Good to go. Slice 1 onion and 2 to 3 stalks of celery. Crush and coarsely chop 4 to 5 cloves garlic. Open can of tomatoes. Have a sip of martini, if you have one handy. Salt and pepper on the tenderloin, quickly brown it in olive oil on all sides in a deep skillet. Set aside on a plate. ... and after. Tasty! And easy. 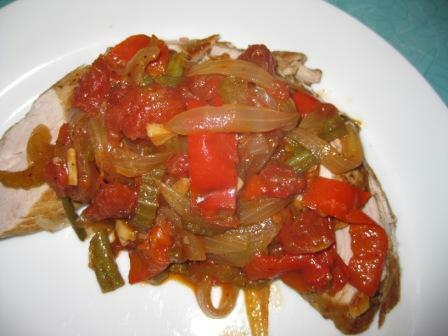 Slice the meat, arrange it on 2 plates, spoon the onion/tomato/pepper mixture over and that’s quite a meal you have! I’m serving it tonight with simple steamed rice and a salad of sliced cucumber tossed with plain yogurt and minced garlic. If anything coming out of the freezer section tastes as good as that, I’ll eat my hat. Which is made with hand-spun alpaca and merino wools, with a bit of milk fiber tossed in, so I might survive if it comes to that.